When I arrived in the United States with my two bicycles I was worried that compared to Europe the riding would be very poor. I had visions of being shoved off of eight lane expressways by SUVs but instead I quickly learned that Washington, DC has an extremely active cycling community. And I saw quickly that many cyclists were riding very high-end machines. It was about this time that I discovered E-Bay and after a short while I found myself in October 2002 the owner of a beautiful 2000 Lemond Maillot Jaune, built up in 2002 with Shimano Dura-Ace parts and dramatic red Velocity rims. I bought it from someone in Wisconsin who had only used it for indoor training and discovered that it was too big for him. When the box arrived, I was certain that the seller had forgotten to pack the wheels given how light it was. But it was indeed all there and looked great. I had always wanted a set of Speedplay pedals and I indulged myself. I also added the CicloSport 434M computer I had bought in Germany in the off-chance I might find a suitable bicycle to put it on. I also upgraded the stem and handlebar (which were a bit too big for me anyway) with new Ritchey WCS parts--very light, strong and cost-effective. The Maillot Jaune was the top-of-the-line Lemond in 2000, made by Trek in Wisconsin, and featured an aluminum frame with an aero downtube and a very cool Time Stiletto carbon fork. It was the same frame that was used by the Saturn professional bike racing team and I acquired a yellow Saturn jersey, along with a classic-looking Lemond Racing Cycles one. I even found a matching pair of Lemond Racing Cycle socks on E-Bay. My wall also boasts a Lemond aluminum shop sign and I have a La Vie Claire jersey signed by the mighty Greg Lemond himself. It was on this bike that I really learned to climb hills, to descend quickly and to race. I had joined the Potomac Pedallers Touring Club and rode with different groups in Virginia and Maryland. Although I tended to ride the Marinoni for big climbs, such as the Mountains of Misery, the Lemond and I spent a lot of time on Skyline Drive and doing a lot of centuries. During the season, which runs in DC from August until early October, we would typically do six century rides in five weeks, including one back-to-back century weekend in each of the last three years. I will never forget the first long ride I did on the bike, which I did in June 2003 with my new friend Jeff, whom I had met at the Mountains of Misery a month before. We had hit it off well and decided to be Real Men and ride the SkyMass route, along Skyline Drive from Front Royal, to Luray, VA, up Massanutten and back along Fort Valley to return to Front Royal. Little did we know what seemed like a reasonable 82 mile ride would turn into one of the worst experiences either of us have suffered while cycling. The 82 miles consisted of what seemed to us, as neophytes, nothing but climbing. Massanutten, in particular, was dreadful, and we were suffering from exhaustion and too little food by the time we came to Fort Valley, which was like a furnace. For the first part of the trip the Lemond was shifting badly as it was not yet dialled in. Jeff's wife was flying back from a trip and was expecting to be picked up at the airport so we were under time pressure as well. We laugh about it now, but we learned a lot about cycling that day. It was on the Lemond that I also spent many happy hours riding with the Lost Boys, a group of fellow Potomac Pedallers. We sometimes rode with the club or just by ourselves and always had a great time. There was always a slight edge of competition that made us all into better cyclists, and we always seemed to take a wrong turn somewhere on our travels in Virginia and Maryland. I took the Lemond twice to the Wintergreen Ascent and to the Coppi Training Camp in April 2006, the camp in California this year and even climbing in Gatineau Park in Ottawa, Ontario. But this Tin Donkey is off to a new owner as tonight I sold my Lemond to a gentleman who works at National Geographic. 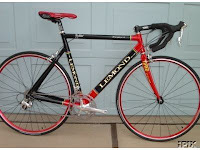 He was looking for a commuting bike but realized immediately that the Lemond was something special. I will help him adjust it and I know then that he will have as much fun with it as I have had. I have included the Lemond Racing Cycles jersey--and the socks!--in the deal. 11504 kms, and 104,345 m of climbing together. The bicycle still looks new and the Shimano parts function flawlessly. Seller's remorse? A bit perhaps, but there is a new Tin Donkey on its way!